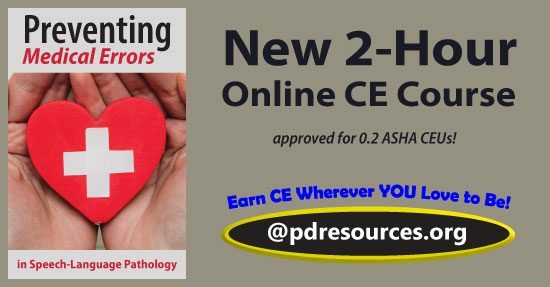 Preventing Medical Errors in Speech-Language Pathology is a new 2-hour online continuing education (CE/CEU) course that examines how medical errors can be prevented in the practice of speech-language pathology. The intent of this course is to include all of the elements required for an approved medical errors course for speech-language pathologists (SLPs) and audiologists, including topics and case examples that will resonate with both novice and seasoned clinicians. It is a required course for Florida licensees and satisfies their biennial requirement. It is intended to be of clinical interest to all SLPs and audiologists who wish to increase their awareness of the ways in which patients can be harmed and the many strategies for anticipating and avoiding such undesirable outcomes. ASHA credit expires 2/25/2024. ASHA CEUs are awarded by the ASHA CE Registry upon receipt of the quarterly completion report from the ASHA Approved CE Provider (#AAUM5150). Please note that the date that appears on ASHA transcripts is the last day of the quarter in which the course was completed. Professional Development Resources is also approved by the Florida Board of Speech-Language Pathology and Audiology, the Ohio Board of Speech-Language Pathology and Audiology, and is CE Broker compliant (#50-1635). This entry was posted in CE Courses, Speech-Language Pathology CEUs and tagged ASHA, ASHA CEUs, CE Broker, continuing education, Florida license renewal, Florida SLPs, Medical Errors, medical errors Florida SLP, online CEUs, Preventing Medical Errors, Preventing Medical Errors for Florida SLPs, Preventing Medical Errors in Speech-Language Pathology, Professional Development Resources, slp ceus, SLPs, Speech Language Pathology, Speech-Language Pathologists by Gina Gunderson. Bookmark the permalink.